When you send a direct payment or disbursement, you care about one thing; that the electronic transfer will reach its intended recipient, with speed and certainty. After all, this is the digital age. When you entrust us with your business, we pride ourselves on our ability to transfer funds efficiently. We offer electronic transfer services, Automated Clearing House (ACH), Real Time Gross Settlement (RTGS) and international wire transfers. Keep reading to find out how you can send money from and receive money to your JMMB account. Our Client Care Centre is open Mondays - Sundays: 8:00 a.m. - 12:00 a.m.
We offer electronic transfer services, Automated Clearing House (ACH) and Real Time Gross Settlement (RTGS) , enabling direct deposits to accounts held in Jamaica’s commercial banking system. 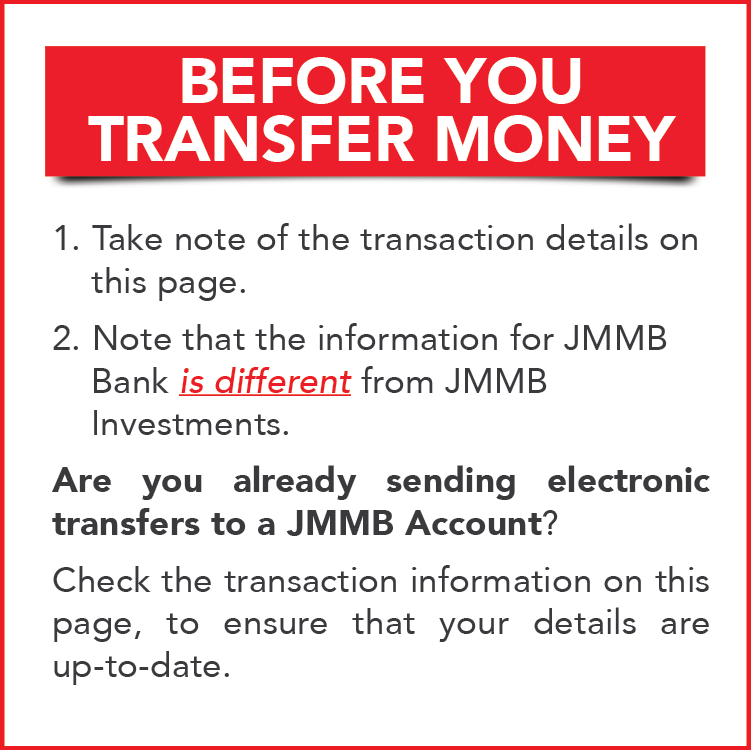 Send money to a JMMB Bank or JMMB Investments account using Automated Clearing House (ACH) transfer. Please note that the Transit Number is made up of the Branch Transit and the Bank Transit Number. The bank code for JMMB Bank is 062. Send money to a JMMB Bank or JMMB Investments account using Real Time Gross Settlement (RTGS) transfer. Please check with your payee to see whether they have a JMMB Bank or JMMB Investments account. If they need any assistance identifying which type of account they have, please have them contact our Client Care Centre at (876) 998-JMMB (5662). Not sure what transfer method to choose? RTGS or ACH? Compare the two methods below to see which method is right for you. Transfers can be completed for any amount. Amounts over $999,999 cannot be transferred via ACH. These transfers are best suited for transactions requiring a faster settlement time. Attracts a servicing fee which can be levied by both the outgoing and incoming bank and is usually higher than the ACH Fee. Attracts a servicing fee which can be levied by the outgoing bank and is usually lower than RTGS. Jamaica Money Market Brokers Ltd.
pidatat non proident, sunt in culpa qui officia deserunt mollit anim id est laborum.